Refractive Lens Exchange is commonly referred to as clear lens extraction or presbyopic lens correcting intraocular surgery. RLE is an emerging type of refractive surgery very similar to cataract surgery. Like many other types of refractive surgery, including LASIK eye surgery, Refractive Lens Exchange corrects nearsightedness and farsightedness. The desired refractive result is achieved with the insertion of a lens implant known as an IOL. Refractive Lens Exchange is a great option for an ophthalmologist to utilize when vision problems extend beyond the limits of lasers. For example, if a patient is too nearsighted but also has a reading issue one of these new multifocal lenses may be a good option. Prior to the advent of the multifocal lens refractive surgeons often performed monovision LASIK or simply just corrected the myopic disorder and then the patient just required glasses for reading. This type of refractive surgery may also be useful if a patient has extremely thin corneas not capable of handling laser surgery. Several visual situations could lead your surgeon to choose a refractive lens exchange as your best option for vision correction. As reading vision problems begin to set in for many people in their 40s and 50s this type of surgery starts to make a lot more sense. Due to the multifocal capabilities of these new lens implants, you now see at both far and near distances. Since cataract surgery is on the horizon and your natural lens will be removed you may consider this option ahead of time. Because Refractive Lens Exchange is a procedure using the same technique as cataract surgery the procedure is regarded as relatively safe and effective. Although AAO guidelines prohibit ophthalmologists from calling this surgery safe it is clear that millions of eyes have received intraocular lens implants during cataract surgery and have had successful outcomes. With the advent of the new multifocal IOL, patients experience excellent vision after surgery. The main difference between these two surgical types is that one is for cataract removal and the other is to correct for refractive error. Refractive Lens Exchange uses the same technique used in cataract surgery. This technique has been used for decades and is the best method for cataract removal and lens insertion. During the surgical procedure, the patient is first prepped using a local anesthetic and drops. After the eye has been sterilized the surgeon will make a 2.5 to 3-millimeter incision in the eye. In order to see inside the eye, our doctors perform this delicate surgery with a powerful magnifying microscope. A device known as the emulsifier is inserted to the eye and begins to remove the natural lens. Once all of the lens material has been evacuated a foldable intraocular lens is inserted in the same place as the old lens. Refractive lens exchange is performed on an outpatient basis and only one eye is treated at a time. After the surgery is complete you will be required to go home and rest for the remainder of the day. Most patients report rapid visual improvement immediately after surgery. ReSTOR Lens is a premium artificial lens that can restore a full range of vision without complete dependence on glasses or contact lenses. The FDA clinical studies identified that 80% of patients receiving the ReSTOR Lens no longer require glasses for any activity. This is a truly revolutionary lens that is a good option for patients that do not like the concept of monovision and would like to have a chance of eliminating glasses. If you have been told you are not an ideal patient for LASIK, the restor intraocular lens might be the next best option. Individuals between the ages of 40 and 60 years of age are typically the best candidates for refractive lens exchange with the Restor lens. If you have both distance and reading issues or you require bifocals this might be a better complete vision solution than the much-respected LASIK eye surgery. Patients often think that they are LASIK patients but after understanding their complete visual picture it is easy to see that the restor provides a better option for independence from glasses. How does the AcrySof® ReSTOR® intraocular lens (IOL) work? Various activities require different types of focusing. Your eyes are constantly changing focus on objects based on distance and proximity. The ability of the eye to actually change focusing is called accommodation. As people get older the ability to accommodate changes and the ability to read becomes impaired. The end result is that patients require reading glasses and in some cases bifocals. The restor lens was specifically designed to correct this exact issue. The lens actually provides both good near vision and good distance vision. By utilizing the apodized diffractive the lens is capable of providing multifocal vision. Diffraction involves the bending or spreading of light to multiple focal points as it passes through the lens. On the AcrySof® ReSTOR® IOL, the center of the lens surface consists of an apodized diffractive optic. This means that the series of tiny steps in that center area work together to focus light for near vision. The benefit for refractive lens exchange patients is a high level of spectacle freedom. Alcon has patented the application of apodization technology to an IOL, making the AcrySof ReSTOR lens the first and only apodized diffractive IOL. 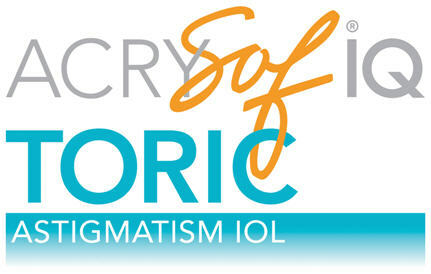 The AcrySof® IQ Toric IOL is an ideal solution for patients with both cataracts and astigmatism. Astigmatism is a common condition that can result in the blurring of your vision, whether looking near or far, while cataracts develop as you age and cloud your vision. This can affect how you perform and enjoy everyday activities such as writing, using a smartphone or driving. Astigmatism usually occurs when the cornea or lens is misshapen and, if you have astigmatism, chances are you already wear glasses or contact lenses to correct the problem. The AcrySof® IQ Toric IOL is designed to replace your clouded lens while also correcting your astigmatism in one step. This can significantly improve your functional vision for activities such as night driving.1 The AcrySof® IQ Toric IOL can greatly reduce, or even eliminate, the need to wear glasses for sharp distance vision, though you will likely still need glasses for reading. Choosing the AcrySof® IQ Toric IOL can also often be a better bargain. The cost of astigmatism-correcting glasses or contact lenses, disinfectant or cleaning materials and eye doctor appointments adds up over the years and can eventually outweigh the cost of toric IOLs. Crystalens AO Lens is an artificial lens implant that can treat both a person's cataracts and presbyopia —the clouding or hardening of your lenses, and the loss of near and intermediate vision, respectively. Crystalens was modeled after the human eye. Like the natural lens, it is a lens implant that uses the eye muscle to flex and accommodate in order to focus on objects in the environment at all distances. 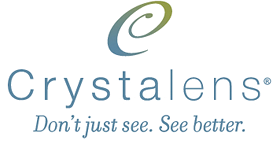 Crystalens dynamically adjusts to your visual needs. Many patients hardly, if ever, need glasses after surgery. Crystalens AO is implanted during one of the most commonly performed surgeries in the world. Over 8,000 standard outpatient cataract surgeries are performed in the US daily. This safe and painless procedure also usually has a quick turnaround, as most patients can return to their daily activities almost immediately after surgery. 100% of the patients could read their Email or computer screens. Presbyopia is the natural deterioration of a patient's near vision. Presbyopia is part of the eyes natural aging process and happens to everyone when they are old enough. The process typically starts in someone's early forties with simple reading vision problems. Presbyopic patients will require bifocal glasses or contact lenses in order to see at all distances. Presbyopia is often referred to as a final frontier in vision correction because it is difficult to completely treat. Many presbyopic patient's think that a laser vision correction is a good option but they are mistaken. By using an accommodative lens or a multifocal IOL with refractive lens exchange presbyopia can be reduced and even successfully eliminated in many cases. Your expectations for eliminating glasses will need to be discussed with your surgeon. The Tecnis Multifocal lens replaces the natural lens and is implanted into the eye during cataract surgery. It has a patented optic design that works like a bifocal lens inside the eye. For long-distance vision, the Tecnis multifocal lens creates a clear image of the faraway object while at the same time a second, highly defocused image is created for near vision that is typically not perceived. For near vision, the Tecnis multifocal lens creates a clear, sharply focused near image and a second highly defocused far away image that is typically not perceived. This unique multifocal optic design gives it the ability to provide clear vision near, far and in-between without mechanical movement of the lens. The lens has the ability to consistently offer patients improved vision at a range of distances, from close-up to middle and far. Because the Tecnis multifocal lens doesn’t work with the muscles of the eye, it is not dependent on a mechanical process or the movement of the lens to give clear vision. The Tecnis Multifocal lens is similar to two lenses in one. One, a refractive lens is for distance, the other, a lens for near vision. This gives the Tecnis multifocal IOL more consistent results and more satisfied patients who can enjoy activities like reading, sewing, seeing your smartphone or looking at the fine print on documents, all without the hassle of reading glasses, bifocals, progressive lenses or contact lenses. With the recent advancements in ophthalmic and optics technology, there are many options to correct myopia and hyperopia. Only your qualified ophthalmologist will understand which option is best for you. If you are myopic laser vision correction or LASIK eye surgery may be a better option. If you are mildly hyperopic the Nearvision CK might be a good option. Please feel free to visit the LASIK eye surgery page for more information.